I have been into Kayak fishing for a couple of years, but for one reason or another (time mainly), I have not written an article on kayak fishing. I hope that will change this year, as I really enjoy fishing from a Kayak. It opens up loads of new marks and compared to boat fishing is far more affordable. Sure you can’t go miles offshore in search of huge wreck Pollock, or easily fish the fast tidal banks, but you can get to areas of deep water that you cant get to from the shore. You can also get to marks that you might think twice about bringing your boat into. In this article I want to introduce Lee Mannion, who lives in Middlesbrough and fishes all around the North East. Lee has been kayak fishing for just over a year now. He has had a steep learning curve, but with the help of some friends, he now gets out on the water at every opportunity. 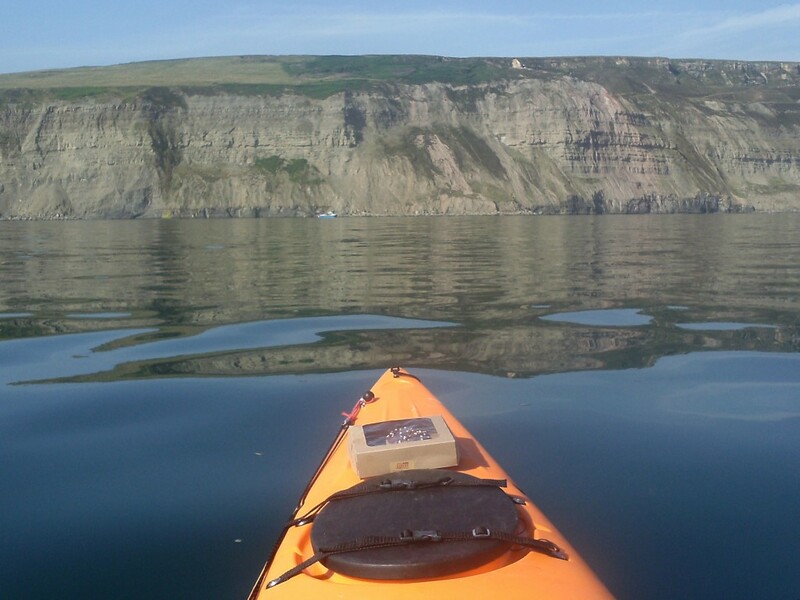 In the first of his articles, he gives us an insight into his first year in Kayaking. It started with Facebook surprisingly; as most things do these days. I was on some fishing groups looking at how to get into kayak fishing as I was reading a few write ups and looking at some pictures and videos when I came across this fishing group called the Fisherman’s Locker. 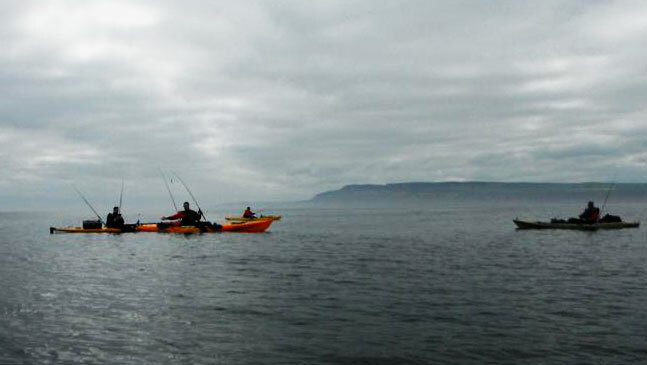 It is a great group full of banter, tips, tricks and all that good stuff and I was asking about what I do to get into sea kayak fishing, when this lad messaged me called Steven watt, who is a now great friend of mine who helps me with most things from fishing to my computer at home. He showed me all the ropes on how to anchor the kayak and how to paddle properly, but first he showed me all about the safety side of things which is the most important bit, as it is a dangerous sport and you have to get the weather right. He also gave me advice on how to use the VHF radio and what Kayak and dry suit to buy. I started with a small kayak, a cheaply made GOSEA which are Chinese made and in my opinion very dangerous. After my first trip Steven told me I should sell it and spend the money on a good one. He laughed at me and said that there’s something wrong if my Typhoon dry suit costs more than the kayak. The rig I use is a scupper pro fishing kayak made by ocean kayak these are the best kayaks as anything under 13ft is a bit risky for the sea and its not worth taking any risks while your at sea. 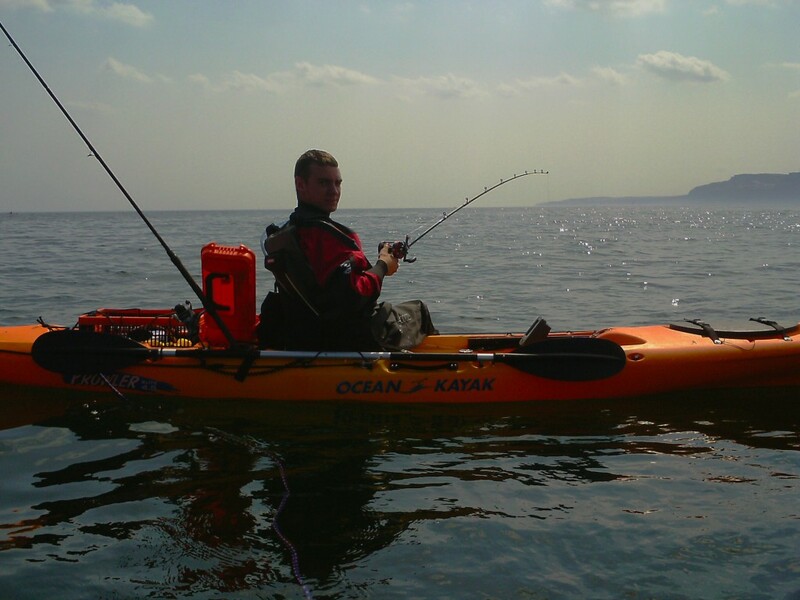 Unfortunately Steven no longer does kayak fishing as he has found a new love of shore fishing. He is also an excellent photographer and does his own videos, ohh not to mention he has a old man back. Steven introduced me to his friend called Jase, he is an awesome guy but very tight mind, and he helps me with the modifications side of things on my kayak, as well as helping with my tackle and rigging. Jase was out on my first trip. Our tackle and rigging is very simple, we use a running ledger rig with the size hook required on the type of fish we want to catch. So if we want to catch big we use a big hook and big baits if we want small fish such as mackerel etc. we use small pretty self explanatory even for the inexperienced. 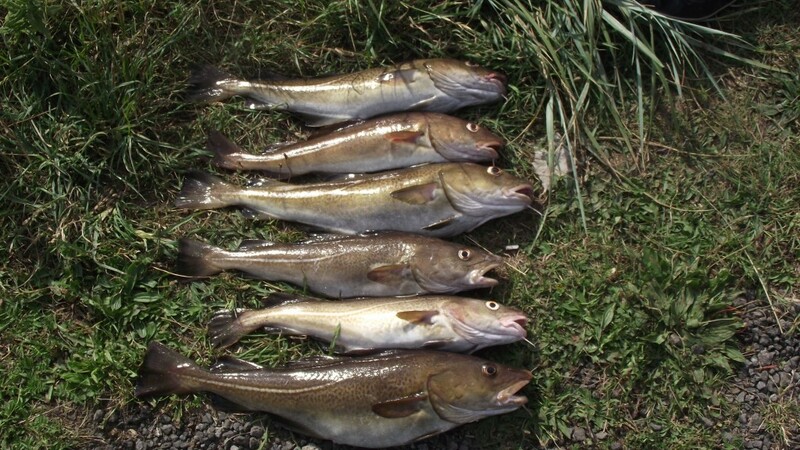 In the summer however we use shads, side winders or twin tails with a hokkaie on and that brings the big Cod and the odd Pollock when jigging up and down for a long time, unless your over really rough ground where the Cod tend to be. We usually fish in a place called Skinning grove about 20 minutes north of Whitby. It is a very rocky area full of cod, Mackerel (in the summer), Pollock and Bass near the cliffs and you may catch the odd wrasse if your in luck, as Steven did once, though he wasn’t happy as he wanted the Cod and Pollock, which are our main species as they put up a great fight and rock your rod like a good one. So yeah our tackle is very simple as it should be. You shouldn’t use anything complicated as you only have little space on a kayak to be messing around. I have learnt a lot from my two friends Steven and Jase, they’ve taught me a everything I need to know up to now and will continue to do so (well I hope so haha). Now I learnt how to rig my self up ready to hit the water and we usually go down to the Tees barrage and practise self rescues, from capsizing to just a tip off. I’ve learnt how to anchor my self properly and let out x3 of the depth from when the anchor hits bottom but you can let out more if you wish. I have also learnt how to land the kayak with out getting tipped by waves as before I got taught how to, I lost a 6lb Cod a Pollock and a £350 Abu reel, which made me really unhappy but now I know how to stop tipping by coming in backwards, it’s a godsend. I have caught many fish my biggest a 6lb cod, which any fisherman will tell you that you will always want something bigger, or you want a double figure fish. 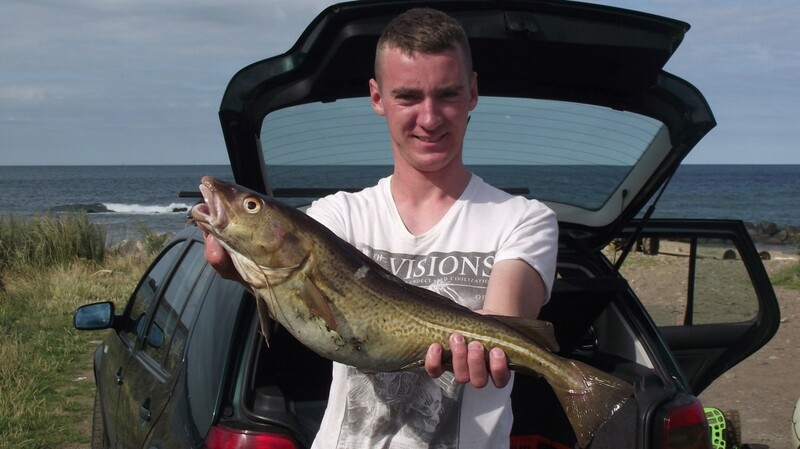 I have also caught a 6lb Pollock and that was the only one iv’e ever caught, but with Cod I catch them for fun all day you just have to find the right ground which takes effort if you haven’t fished that area before. I do it using my fish finder, which are awesome and very helpful bits of kit. I also caught a whiting on the second trip I went out. I haven’t caught any Bass yet, but hopefully will this year when me and Jase go out on the Bass hunt with plugs which I’m looking forward to this year, maybe the odd Pollock as well and also Iv’e caught countless Mackerel, every time you drop down bang! You have got a Macky on and there very annoying when your after other species.